Three Chimneys Farm's Carina Mia was perfectly ridden by Julien Leparoux to capture Saturday's Grade 1 Acorn Stakes by 1 1/4 lengths, defeating Kentucky Oaks winner Cathryn Sophia and Black-Eyed Susan winner Go Maggie Go. The sophomore daughter of Malibu Moon covered a mile over Belmont Park's fast main track in 1:34.97 for trainer Bill Mott. Carina Mia broke with the field, but she allowed Leparoux to take her back to the rear of the six-horse field. She had shown a similar style by accident last out in the Eight Belles on Kentucky Oaks Day, breaking poorly and making one run to dominate that field. This Saturday, she waited along the inside rail, saving ground through the one-turn mile event. On the front end, Go Maggie Go and Paola Queen dueled for the lead through a first quarter in :23.05, just noses apart. Cathryn Sophia was just behind those two, but made her presence felt approaching the half-mile pole, splitting rivals to enter second place, marking the fraction in :46.17. Nearing the head of the lane, Cathryn Sophia took over the lead by three-quarters of a length, but she appeared to struggle with Belmont's wide turns, as she changed to her right lead nearly a sixteenth of a mile before the top of the stretch. This bobble allowed Carina Mia to take advantage, as Leparoux guided her to the outside with a perfectly-timed burst of acceleration to gain the lead at the three-sixteenths pole. She held a two-length advantage with a sixteenth of a mile to run, which shortened to a winning margin of 1 1/4 lengths as Off the Tracks made her final bid, finishing second while never quite threatening the lead of Carina Mia. Cathryn Sophia held on to be third, a length behind Off the Tracks. Go Maggie Go nosed out Paola Queen for fourth. “We thought there was speed in there,” said Mott. “It actually turned out to be a little bit more than what we thought. Certainly Cathryn Sophia, it looked like they wanted to send her into the race a little bit. Bred in Kentucky by Spendthrift Farm, Carina Mia was a $410,000 yearling purchase at the Keeneland September Sale. The Acorn is her first Grade 1 victory, and marks her fourth lifetime victory from just six starts. 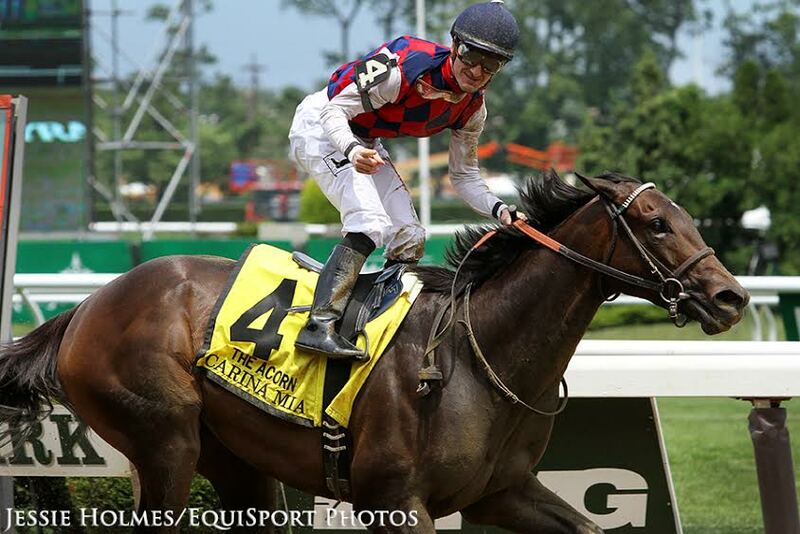 Carina Mia's share of the $700,000 purse brings her career earnings to nearly $730,000. This entry was posted in Racing, Videos and tagged Acorn Stakes, belmont park, bill mott, carina mia, cathryn sophia, julien leparoux, malibu moon, off the tracks, Three Chimneys by Paulick Report Staff. Bookmark the permalink.